The weather has been beautiful this weekend! Finally! Just when we were all starting to feel like we were trapped in Arondale’s eternal winter, we could actually venture outdoors without a jacket on! I don’t know about you, but by the time 5pm rolled around, my entire neighbourhood smelled like a giant BBQ. Just when I thought it couldn’t get any better my husband started up the lawnmower and cut our grass. And so, there I was, watching my kids playing on the swing set, intoxicated by two of my favourite smells of summer! 🙂 And so what, you ask, could make this moment even better?! The PERFECT summer salad! This salad is sooooo good!!!! It has a fresh, yet sweet taste. It is the the perfect accompaniment to your favourite BBQ dish! Slice and dice the avocado and mango, red onion and cucumber. Finely chop cilantro. 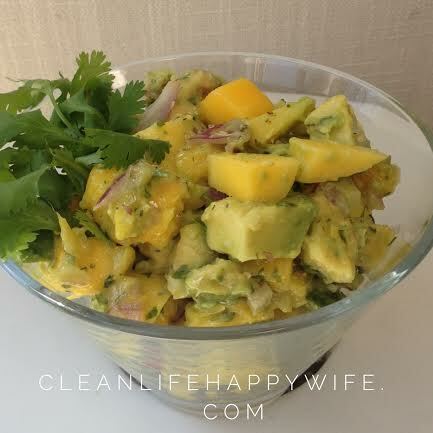 Combine all ingredients together in a bowl and mix in lime juice. Sprinkle with sea salt and put it in the fridge to chill.